Part 3 of this series dealt with changes in transverse stability taking place once a vessel starts travelling through the water. This article discusses the way the stability of sailing yachts can be challenged at sea as a result of wave action. Wave action doesn’t reduce stability, it compromises it, sometimes to the point of overcoming it completely. The dynamics are completely different. What happens when a wave breaks on the beam of a yacht depends on size of the wave, its speed, the timing of the break and to some extent the properties of the vessel. If the wave is powerful enough, the result is always disastrous. Yachts are least stable in roll; they are designed with low forward drag and high lateral resistance to be able to sail upwind and they offer the largest exposed area to the sea from their side. In other words, in the case of a beam sea, everything is about as wrong as it gets. There is no such thing as a good or correct way of taking a dangerous sea on the beam. There are three classic, textbook variations leading to knock-down or capsize in beam seas. 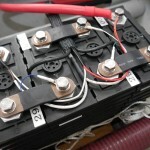 The differences resides in the size of the sea in relation with the boat and the amount of energy involved. While fin-keelers are particularly sensitive in such situations for reasons that will be developed just below, other types of yachts are nowhere near immune to it. Wave impact is the most common event because it starts happening as soon as wave faces steepen and break. Consequences develop when the power behind the blow becomes sufficient. If a fixed-keel yacht is suddenly and violently pushed sideways, as when hit on the beam by a large wave crest, the keel can generate a very large lateral and opposing force deep in the water. The same applies to the rudder. A powerful force moment develops between the impulse from the wave pushing the hull to leeward in the topsides and the lateral force from the keel and rudder resisting to weather deep down. This moment causes the yacht to heel to leeward. Classic wave-impact capsize. How far the sequence goes depends on the energy involved. A rogue wave presents a steep face about as high as the freeboard, breaks and slams into the length of the hull to weather. The appendages do their job and hang on to the flow, developing a huge opposing reaction force. A large turning moment is created and the hull starts heeling; for as long as the appendages are resisting, the wave can pour kinetic energy into the system. Roll momentum develops. The boat heels over heavily, the keel “disappears” behind the hull and becomes too inclined to keep offering any significant resistance. Most of the capsizing moment disappears, but the pressure from the wave is still pushing the heeled hull: the boat starts washing off sideways, the righting moment of the hull is close to maximum. If the amount of rotational energy transferred into the system at T=0 wasn’t too high, stability will overcome the momentum, the wave will now pass underneath the hull and the yacht will right itself. The knock-down energy imparted at T=o depends on how good a job the appendages were doing and how long the boat took to heel over and start skidding. Our boat had a heavy mast and good appendages, maximising energy transfer, and the wave was fast. The momentum from the blow carries over, the righting moment of the hull starts declining and the leeward side deck enters the water while the hull is still being carried sideways by the wave. The braking effect from dragging the side deck through the water now results in a new heeling moment with more energy being supplied towards a capsize. And it happens. The hull keeps rolling further as the wave leaves it behind at an unpleasant angle. Whether or not it comes back is now a question of angle of vanishing stability. The danger is common for small yachts displacing a few tonnes only and small boats sailors taking on inclement latitudes are usually extremely wary of their position in the sea when a break is a possibility. In regions where the sea higher and longer, the velocity of the waves can be such that yachts of 10 to 20 tonnes have been capsized in good weather by direct wave impact as described here. If the vessel lies in the sea with no forward speed whatsoever in such a situation, drifting sideways, resistance entirely originates from drag. The drag force in this case may not increase as violently and the boat may “yield” somewhat more, but this is no guarantee whatsoever that the same won’t happen anyway. Furthermore, it can be difficult to guarantee that the appendages are effectively fully stalled at all times. A small amount of forward motion can reattach the flow to the foils and cause the keel to grip. Modern fin-keelers are particularly sensitive to beam-on wave impact because their appendages are capable of developing higher reaction forces while they often present more exposed hull area in the topsides and less displacement. This doesn’t in itself make them dangerous or worse sea boats; it is just that the difference needs to be understood and taken into account. 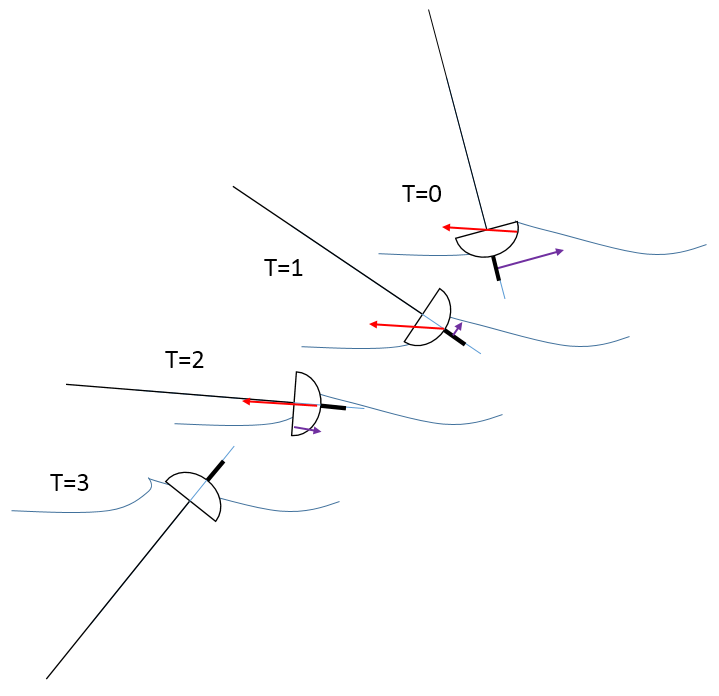 If the vessel has forward motion, the lateral resistance produced by the appendages is governed by boat speed and the angle of attack of the flow on the foils; the lateral force can increase up to the point where they stall. At speed, this limit can be extremely high and most of the impact energy is converted into rotation. If the boat is drifting sideways, the appendages are already stalled and the resistance increases with the square of the drift velocity when the hull is pushed sideways. One should keep in mind that absence of fins is usually offset by a large lateral area in most fixed-keel designs, and resistance is also proportional to the lateral area being dragged through the water. In heavy weather, the crest can become large enough to simply carry away hull and appendages indiscriminately and the vessel gets dumped in the trough preceding the wave, falling together with the mass of water in the crest. In this case, damage is typically recorded from impact on the lee side upon landing in the trough. A yacht can free-fall this way several metres if the sea is high enough. It is a classic and has happened to large, heavy vessels. The wave still has to pass over the boat and further unpleasant developments can follow, it is a matter of how long it keeps breaking for. The actual stability and configuration of the vessel have very limited relevance. In a large, heavy sea, getting dumped can represent a catastrophic event with smashed windows and roof coaming on the lee side, leeward hull damage, serious injuries to the crew, structural damage and more. Strength-to-weight ratio becomes everything. Incidentally, people on board don’t rate very high on this scale. Many rescues today in areas such as the Tasman Sea are purely prompted by injuries incurred in such impacts. A variant takes place when the wave face is just too steep and too high for the hull to ever make it to the top. A tell-tale sign is that there is no violent impact. The yacht gets caught beam-on into the roller, any form of draft creates lateral resistance and the boat commonly gets rolled over to a very high angle, sometimes over 360°. This easily leads to dismasting. In the same conditions, ballasted centreboard yachts may be able to prevent most of the capsizing moment from developing by lifting their centreboard. This was demonstrated as early as the 1880s with the Presto boats: moderately deep, ballasted, round-bilge flat-bottomed centreboard yachts that cruised the waters of the US Atlantic coast. Ballasted centreboarders have seen a limited resurgence since the mid-1970s as some started taking them offshore-cruising. A strong proponent of them at the time was the Belgian Patrick van God, who wrote about his experiences on board Trismus – if one can stand the personality of the author. Still, he did venture to the Antarctic with it, observed the behaviour of the hull in breaking seas and had a reference point from earlier cruising on board a 12-metre steel Joshua. I never personally experimented with a centreboard yacht in heavily breaking seas. However, over the years a few owners of centreboard cruisers independently pointed out to me the striking differences in the dynamics of the boat when it took a beam hit. One of them was a heavy 44′ steel yacht that took such broadside hits in Antarctic waters in 1996 that one crew was washed clean overboard and away, only to be found alongside the hull again after the next sea. He was hauled back on board, just slightly refreshed and rehydrated. The sea temperature would have been 1-2°C after all. They spontaneously pointed out how the boat skidded sideways without significantly heeling over when hit beam-on, and one person emphasized it by saying it would have been unthinkable for a keeler. This being said, I can’t see how a ballasted centreboard yacht beam-on into the sea would avoid getting dumped in a trough, should conditions become serious enough. Even if it landed more upright for the sake of the argument, I would rather not be on it on that day. In my view – from the angle of the sailor and designer – I would rather own a good ballasted centreboard yacht than the average shallow draft cruising keeler. It would make a far better sea boat.